School is a great opportunity for people to be educated, obtain new skills, establish connections, and lead a successful life. Like all other places, school has its cons. The food is alright, some teachers are torturous, and the school that you attend is not ranking high in the education system. Then, there are bullies. Bullying is typically carried out in the form of low-level violence, but a bullying session can escalate into more of a violent situation. 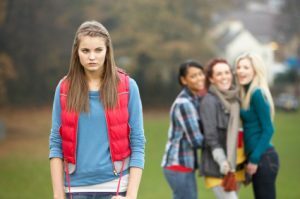 Bullies are no different from anyone else, in light that they’re weak…..in a way. There are ways of dealing with a bully and getting rid of them. Bullies can be found anywhere on the school’s premises. There’s more than likely to be some waiting inside by the front entrance. Sometimes, there aren’t. They could be bullying elsewhere or skipping class. Because of the possible inconsistency of the appearance of bullies there, you take the front entrance to get to class. If bullies happen to be nearby and verbally insult you, then tune them out as you proceed to your class or destination. Don’t even look at them. There’s a good chance that they’ll get bored and become disinterested in you. Some bullies are persistent and won’t rest until they’re satisfied. If they approach you in a group and manage to torture, humiliate, or do both to you, then rally up some of your friends in school and tell them what happened. Have them accompany you to class and wherever else possible. Don’t have them approach the bullies. It may look just as bad on your part. Let the bullies approach while your friends in school are beside you. The bullies will back off. Teachers and any other faculty member will serve as great alternatives for school friends. That’s if you don’t have any. Whether you do or don’t, teachers are the best people to go to when trying to deal with bullies. Hang out with them at the end of class and after. Adults are usually good at being intuitive when it comes to seeing if a child or teen has a problem. Broach the subject with your teacher. Inform them that you’re being bullied. State the name of the bully, or bullies, if possible. Don’t be discouraged in doing this. Depending on the severity of the bullying, telling your teacher is the only solution. In addition to telling your teachers about you being bullied, tell your parents as well. This will provide you with further protection and bullying will come to a halt.